You've probably heard the buzz about Eclipse, the powerful open source platform that gives Java developers a new way to approach development projects. It's like a shiny new car--no longer content to just admire Eclipse, you're now itching to get in and drive. Eclipse is to Java developers what Visual Studio is to .NET developers--it's an integrated development environment (IDE) that combines a code editor, compiler, debugger, text editor, graphical user interface (GUI) builder, and other components into a single, user-friendly application. It provides a solid foundation that enables Java developers to construct and run integrated software-development tools for web development, application design, modeling, performance, testing, and much more. As with any extensive programming tool, however, there's a lot to learn. And there s no better guy than well-known Java expert Steve Holzner to teach you. An award-winning and best-selling author who has been writing about Java topics since the language first appeared, Holzner delivers just the kind of targeted, practical, everyday knowledge you need to hone your mastery of Eclipse. Perfect as a companion to an Eclipse programming tutorial (such as Holzner's own Eclipse, O'Reilly, April 2004) or an ideal stand-alone for all those developers who either don't want or don't need the tutorial approach, the Eclipse Cookbook contains task-oriented recipes for more than 800 situations you may encounter while using this new Java platform--from deploying a web application automatically to reverse engineering compiled code, from re-naming all references to a class across multiple packages to initializing the SWT JNI libraries. Each recipe in the ever-popular and utterly practical problem-solution-discussion format for O'Reilly cookbooks contains a clear and thorough description of the problem, a brief but complete discussion of a solution, and in-action examples illustrating that solution. 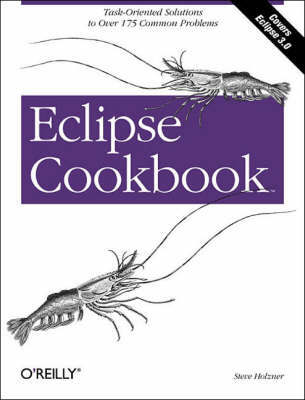 The Eclipse Cookbook will satiate Java programmers at all levels who are ready to go beyond tutorials--far beyond writing plug-ins and extensions--and actually use the powerful and convenient Eclipse day to day.